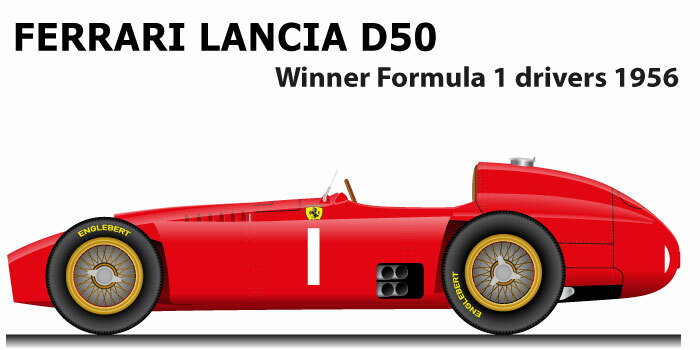 The Ferrari – Lancia D50 is the winning car of the Formula 1 World Championship in 1956. Designed by engineer Vittorio Jano in 1954 on the decision of Gianni Lancia to participate in the Formula 1 World Championships in the two-year period 1954-1955, although with poor results . In 1956 the car was bought by the Scuderia Ferrari that made some very important construction changes, the main one was the displacement of the tank in the rear and not in the large sides that were maintained. Juan Manuel Fangio with the Ferrari – Lancia D50 won the 1956 F1 World Championship, for the Argentinian rider was the fourth world title. After the Mercedes retreat, Fangio went to Ferrari and during the season won three Grand Prix: Argentina shared with Luigi Musso, Great Britain and Germany. Fundamental was the second place shared with Peter Collins in the Italian GP last race of the season, where he obtained three points with which Stirling Moss detached in the standings.